Posted February 27th, 2012 by Rob Parungao & filed under Comics. Initially, this post was supposed to be a list of some great black characters in comic books in celebration of black history month. A quick Google search will show that this exercise has been done over and over again, and while these lists certainly showcase the history and importance of black comic book characters (characters like Storm, Steel, Black Panther, and so forth), they predominantly focus on the fantastical aspects of their existence rather than on how well they are portrayed. While I love the idea of a black Nick Fury in the upcoming Avengers film I question whether an angry, swearing black man really challenges racial stereotypes? One could argue that comics don’t need to be progressive, and that just having a black character that doesn’t reinforce negative stereotypes is already breaking ground. Perhaps, but I tend to expect more from writers, especially if I’m ponying up some hard-earned cash. Below is a list of some strong black characters that I’ve come across that are not only well-written, but are socially progressive as well. For many comic fans, the re-launch of the Ultimate Spiderman series with a black Spiderman was a politically correct middle finger. A few years ago the internet’s proverbial head exploded when Community star Donald Glover tried to get an audition for the upcoming Amazing Spiderman film. Message boards around the world made clear that fans were not happy with the idea of a black Spiderman simply because it was not in the comic book cannon. 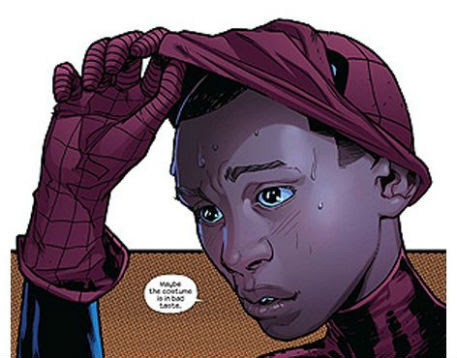 Marvel decided to return the favour by killing off Peter Parker in the Ultimate universe and replace him with Miles Morales, effectively ensuring that there indeed was a black Spiderman in print. Further, writer Brian Michael Bendis pushes the envelope with Morales, ensuring that his story is not only a compelling one, but one that explores the everyday life of many black youth in America. Unlike Peter Parker who grew up in the predominantly white New York suburbs, Morales’s childhood is marked by poverty. His parents take him to a charter school lottery in an attempt to ensure that he get out of the ghetto through education, a scene more tense than any fight sequence. Not to out-done by Marvel, DC decided to introduce David Zavimbe as Batwing, a new superhero in their New 52 launch. Like Bendis’ Spiderman, writer Judd Winick ensures that the character’s story is rooted in real social issues, this time in the Democratic Republic of Congo. His parents died of HIV/AIDS at an early age and he was drafted as a boy soldier to fight in a war that ravaged his country. Overall the story has received praise on both the writing and the artwork and while the story may convey ‘Africa needs saving’ tropes, Winick understands that it is Africans who have the greatest degree of agency to influence change in their home, not outsiders. Well-written black superheroines are few and far between in mainstream comics. You have Storm from the X-Men comics then you have a barrage of C-listers who periodically show up when writers need a plot device or a bit of token ethnicity on a page. In Brian K. Vaughn’s Y:The Last Man Agent 355 is a member of the Culper Ring, a secret government agency and accompanies Yorick on his five-year cross-continental adventures after a mysterious plague kills off every man on the planet. Unlike her lovingly goofy companion, she is focused, and talented. While women in comics are often reduced to revealing outfits and hourglass figures (pandering to comic’s primary demographic), 355 is defined by her competence and leadership and doesn’t need to show skin to attract readers to her character.